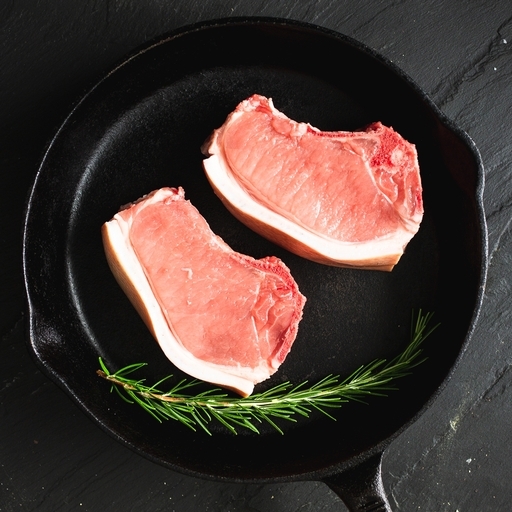 Glorious organic pork chops. Ready to eat hot and sizzling from the pan in just a few minutes. Also good grilled or roasted in a tray with wedges of cabbage and apple. Whichever way you choose to cook them, they stay beautifully juicy, as we leave the bone in. Approximately 2 pork chops per pack. Try scoring through the skin and fat at intervals; it stops the chops curling as they cook. Season well on both sides. Fry or grill on a medium-high heat for 5-6 mins a side, until golden brown and completely cooked through. If frying, use a pair of tongs to press the fatty edge into the pan to colour, too. Let them rest for at least 5 mins before eating.